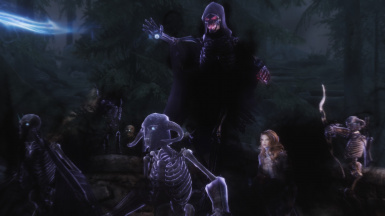 -*Tweaked necromancer wenches to summon less skeletons. 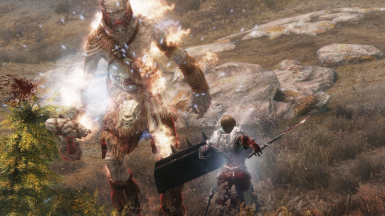 -*Wenches damaging cloaks will damage only enemies now. -*Added a quest to rescue 5 named wenches. -*Added radiant quest to rescue more wenches. -*Added "wanted patron poster" near Solitude's main entrance. -*Changed wenches classes stats. (this affects all the wench expansions, making them a little easier). *-Tweaked wenches scenes conditions to exclude followers and custom voiced npcs. *-Added dialogue "your customers are acting weird..." to all wenches to be used to reset immersive wenches quests just in case any npc gets stuck in a scene for whatever reason. -Reduced gold for mechants (they will still have 2000 more gold than normal merchants) so they are compatible with mods that increase gold for merchants. -*Added: vampire keywords to vampire wenches. -*Tweaked: summonned wenches "explosion fx" will trigger just one time. -*Tweaked: current followers wont be part of wenches scenes. -*Removed: dialogue option for the summon wench spell books. 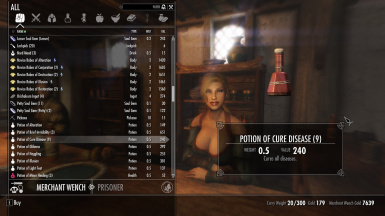 -*Added: Wench in a bottle potions and drinks. 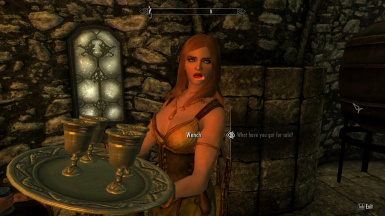 -*Added: dialogue option to buy a special drink to summon "the bottle handler wench" + a random drink. 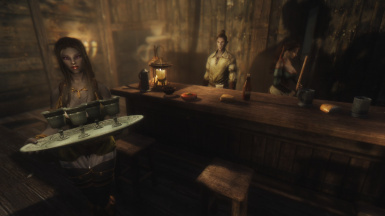 -*Added: Bottle handler wench, you can buy the summon books/drinks from her, she also sells other random items like other general store merchant. its a temporary summon so you can summon her anywhere you want. -*Changed: wenches are flagged as protected now. -*Tweaked: Reduced defenders disarm chance to 3% from 5%. -*Tweaked: Reduced defenders fear on-hit chance to 10% from 12%. -*Tweaked: Reduced heal regeneration effect of berserker´s rage. -*Tweaked: Reduced number of summons of the necromancer wenches. -*Tweaked: Reduced on hit paralysis effects chance to 5% from 7%. -*Tweaked: Reduced blademasters on-hit paralysis effect chance (right after invisibility) from 70% to 30%. -*Tweaked: Reduced defenders disarm chance to 5% from 15%. -*Tweaked: Reduced stagger effects chance to 15% from 100%. 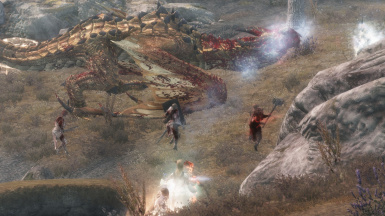 -*Fixed: you wont get the "tank StandShout" when you kill the first dragon "Mirmulnir"
-*Tweaked: higher level mage wenches will now summon a random atronach instead of just only the flame atronach. -*Tweaked: vampire mage wenches will summon a random skeleton at low levels. -*Tweaked: Mage´s Massparalysis spell wont turn hostile other friendly npcs/or followers. -*Tweaked: defender/tank wenches shout wont turn hostile other friendly npcs/or followers. P.D: the stagger effect of some spells will affect all npcs even the player (I like that :D) but they wont turn hostile. a "clean" save installation or a new game. 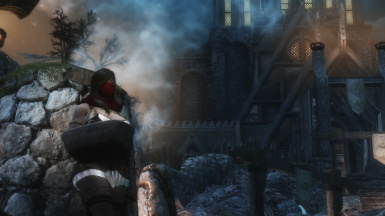 -*changed: dawnguard and dragonborn now required. -*Fixed: wenches attacking player for whatever reason. -*tweaked: Bodyguards outfits are less random now. -*tweaked: all factions affecting wenches. -she will leave her town/city factions. -she will be ally to the player. -she will have "brave" confidence level. -she will have the correct aggresive behavior to act as a follower. -*changed: "tip" dialogue has no cooldown now, reduced gold required to 35. -*changed: hired bodyguards have their own faction. they should only protect travelling wenches now. -*added: a new dialogue option so you can "relax" with wenches, they will give you a buff depending on their combat class, so its an easier way to know their class. 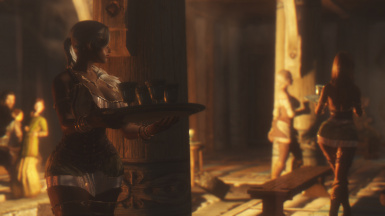 -*added: wenches to some dawnguard locations. 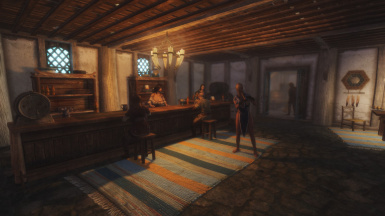 -*tweaked: honningbrew meadery is now an inn type interior, added a bard and some patrons. 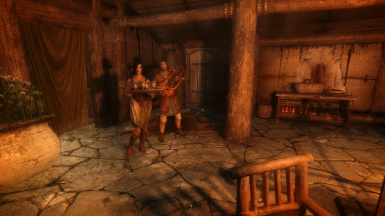 -*added: a bard to the bee and bard inn. -*removed: combat/ghost wench spell books. -*tweaked: Summonable wenches levels 1-20, removed shared factions with regular wenches. number of wenches again, they will not disappear with the others. 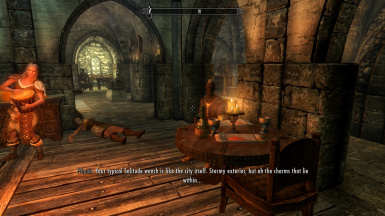 -****added: A dialogue option to uninstall mod at the orc in honningbrew meadery. -****Fixed: Some ai packages and other little details. 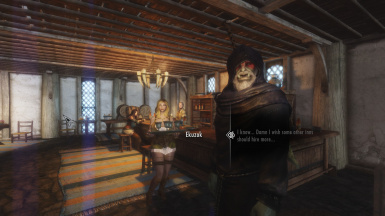 -*added: "taverns plus patch" to the main mod, You can activate it talking to the orc at honning brew meadery. -*Changed: wenches are unique, protected and non-respawnable. -*changed: wenches have names now. -*changed: wenches can be followers or spouses except summonable wenches. 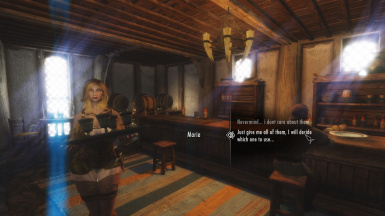 -*added: dialogue options to recruit a wench: you can convince her with your speech level skill or pay them. -*added: an extra dialogue to tell a wench to stay in the same location after she stops being your follower. 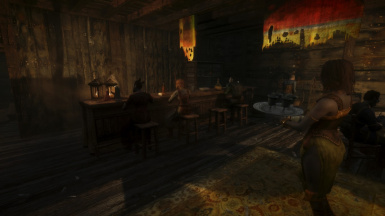 -*added: alcoholic beverages, you can buy them by a dialogue option at any wench. -*changed: Now i consider the spellbooks "cheats" (lol) you still can get them via dialogue from any wench but just once, you can also say you dont want the books, after the dialogue ends its disable. -*added: summon wench merchant spell. -*added: summon wench ghost spell. 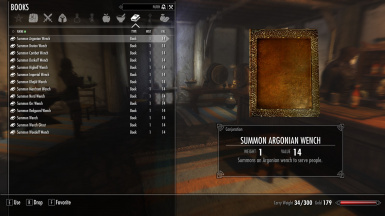 -*added: summon spells for each race. -*added: wenches to other places. -*added: an esm file to handle the different versions of the mod. -*changed: ai package that made wenches play the drink animation during late night. barmaids will play that animation instead. -*added: the option to get bounty quest (limited by the game depending on your level, location, etc) and some common rumors (limited by voice type) from tavern wenches. -*fixed: wenches carrying drink trays outside the inns. -*changed: summonable wenches will wear the default wench outfit and will have the empowered wench clothes in their inventory. -*changed: lower wenches and bodyguards agression. -Reduced the number to 13 travelling wenches. 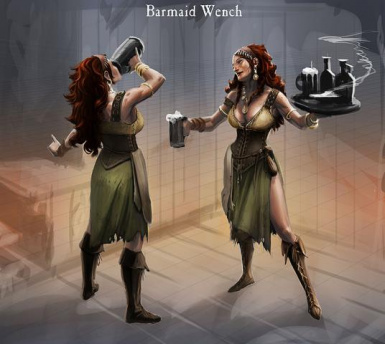 -travelling wenches outfit is random: barkeep clothes,barkeep clothes variant or wench outfit. -They will be a little rare to see on the roads now. 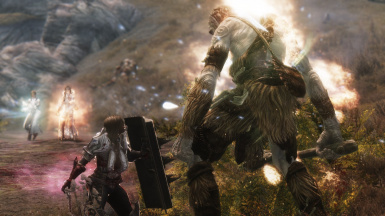 -*added: compatibility with ¨The Way of the Dovahkiin - Ultimate Deadly Encounters¨ mod to avoid cloned wenches. -*tweaked: weghts of the wenches, their weights are from 60-100 for human races, other skinny races like elves are from 20-60. i recommend that the differences between 0 and 100 weights are noticeable in your body mod. -*Fixed: missing factions in some wenches. -*Fixed: Schedule of wenches merchant faction. 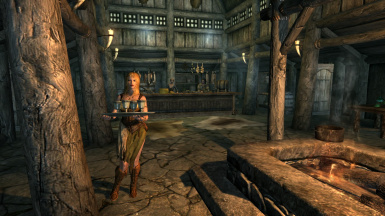 -*Changed: Riften: bee and barb inn wench and haelga´s bunkhouse wench to have random races now. -*fixed: Wenches will stop holding their drinks tray if they are attacked and can fight, Wenches that cant fight will run away and cower. -*Tweaked: some ai packages and other little things. File 'Immersive Wenches -Immersive Citizens AI Overhaul Patch-__' changed to 'Immersive Wenches -Immersive Citizens AI Overhaul Patch-'. File 'Immersive Wenches __' changed to 'Immersive Wenches'. File 'Immersive Wenches_' changed to 'Immersive Wenches'. File 'Immersive Wenches -SG hairs- Patch--' version changed to 1.6.0. File 'Immersive Wenches -SG and KS hairs- Patch (KS hairs 1.5)' version changed to 1.6.0. File 'Immersive Wenches -KS hairs- Patch (for KS hairs 1.5)' version changed to 1.6.0. File 'Immersive Wenches -Apachii hairs- Patch' version changed to 1.6.0. File 'Immersive Wenches -SG and KS hairs- Patch (KS hairs 1.4)' version changed to 1.6.0. File 'Immersive Wenches -KS hairs- Patch (for KS hairs 1.4)' version changed to 1.6.0. File 'Immersive Wenches' description changed. 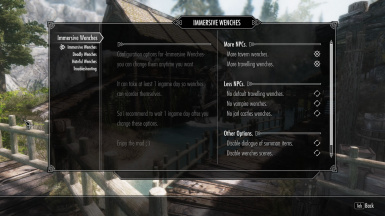 File 'Immersive Wenches' version changed to 1.6.0. 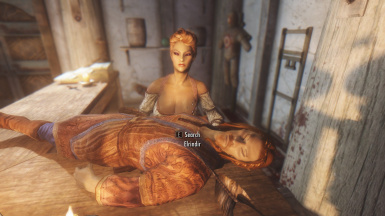 File 'Immersive Wenches -Realistic Room Rental Enhanced Patch-' version changed to 1.6.0.